(MP152). Frank Watson Wood (1862-1953). 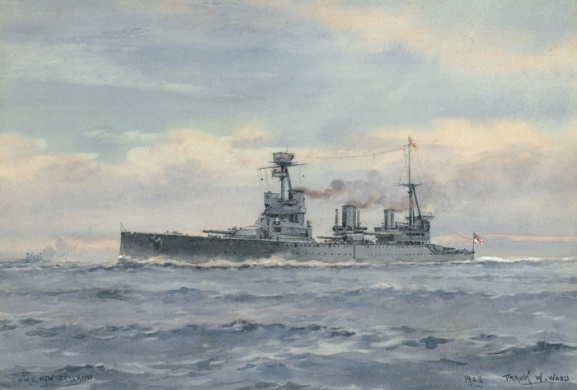 Watercolour, signed and dated (LR) 1928; and annotated (LL) HMS NEW ZEALAND. Standard size: 14 x 9.5ins (36 x 24cms) approx. NEW ZEALAND, one of the Indefatigable Class of battle cruisers, was laid down on 20th June 1910 at Fairfields’ yard on the Clyde and was completed in November 1912 (RMS TITANIC had gone down some 6 months earlier to put dates into perspective). Of her 2 sisters, HMS INDEFATIGABLE had completed 18 months earlier and HMAS AUSTRALIA was not to enter service until the summer of 1913. The class were basically just stretched versions of the earlier Invincibles with the same main armament except that the 12 inch guns were of 50 calibre as opposed to 45 calibre in the earlier class. The Dominion of New Zealand was proud to pay the bill for “their” ship but unlike the Australians - who had also paid for their ship - the New Zealanders were keen for the battle cruiser to serve with the Royal Navy from her commissioning. The Australians, however, wanted to keep their ship for their own defence - although once war broke out in Europe AUSTRALIA, too, was quickly put at the disposal of the Royal Navy. HMS NEW ZEALAND served with distinction throughout the Great War and achieved, it seemed, a certain immunity from damage in action: this was put down to the grass skirt worn by her captain when in action, a skirt presented by the Maoris from her home country! In 1919 she carried Admiral of the Fleet Lord Jellicoe on his fact finding tour of the Dominions but was targeted by the Washington Treaty and was taken out of service for disposal on 10th December1922 and was broken up in Rosyth, Scotland - an all too short life.